Telopea speciosissima - is the botanical name of this plant that belongs to the family Proteaceae. 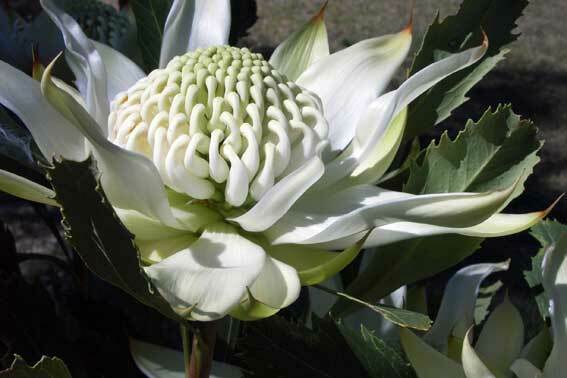 Waratahs are the state emblem of NSW, and the most common species - Telopea speciossissima - had a wide distribution throughout the Hawksbury Sandstone - from Nelson Bay to Sydney and through to the Southern Highlands, and onto the Blue Mountains. The Waratah is one of the most prized flowers on earth, and the beauty of the flower has led this plant to become vulnerable in its natural habitat. Paul Nixon is the founder of the 'Brimstone Collection' which commenced with the chance finding of an extremely rare larged head waratah he quickly coined - Fire and Brimstone, from the Southern Highlands, 2hrs from Sydney. Paul Nixon grew this plant out from cuttings - and from these cuttings developed with a lot of interbreeding a collection of waratahs ideal for the cut flower market in Australia.